A recent Lawry’s survey found that your choice of flavor says more about you than you think. The nationwide poll looked at preferences for tart, spicy, sweet, and savory flavors and found that your choice can reveal some interesting aspects of your personality. If you are one for tart flavors, you tend to be extremely happy overall, particularly with your family, finances, work/life balance and even your health. As a Joyous Joiners you are an extrovert who loves to entertain at home, find it very important to join in social events in your community and are active on the greatest number of social networking sites. As a Sweet Lifer, home and family are close to your heart. You are the kindest and most loyal, although you probably wouldn’t admit that as you are also the most modest. As an individual that prefers sweeter flavors (honey and fruit-infused), you are influenced by your parents, enjoy family entertainment, and consider yourself spiritual. Your passion for savory flavors shows you have an enthusiasm for politics, enjoy camping and hiking and love outdoor barbeques and American cuisine. Along with the other Conventionalists, you tend to be more introverted than the rest of the groups and often describe yourself as a homebody. -Asian Style Beef & Broccoli – This easy to prepare stir fry meal will remind your family of their favorite Asian restaurant. The dish combines beef, broccoli and seasonings with a hint of garlic. Serve it over rice and you have a complete, satisfying meal. -Chimichurri Burrito Casserole – Lawry’s gives the familiar Burrito casserole a new twist with this traditional Latin American sauce. With a few simple fresh ingredients, mealtime just got a lot more exciting. -Mediterranean Sundried Tomato & Garlic Chicken – Add a taste of the Mediterranean to your family’s casserole. This easy to bake casserole combines chicken, pasta, tomatoes and Feta cheese to easily make a flavorful meal any night of the week. -Tuscan Style Chicken Marsala with Garlic and Basil – Chicken Marsala is a restaurant favorite, but it might not make the menu at home. This effortless version comes together on your stovetop with just a few fresh ingredients. Flavorful garlic and basil gives this meal its own Tuscan flair, perfect for serving over pasta or rice. As I've mentioned before; I love to cook! There's something about coming together as a family after a long day ...... and sitting down to a good meal and each other's company that I will never tire of. I was excited to try the marinades and seasonings from Lawry's; adding flavor to old recipes, and new flavors and recipes that I've had in the past though I have never ventured to make myself at home. The Beef and Broccoli Seasoning Mix made the meal preparation quick and simple! The outcome was a delicious dish that I would definitely make again for my family! They loved it....and so did I! All of the Lawry's seasonings and marinades were flavorful adventures, and we truly enjoyed each and every one. For a flavorful meal that brings the family together at the end of the day, check out Lawry's marinades and seasonings, I am sure your family will enjoy them as much as we did! You can find Lawry's Seasonings at a grocer near you. 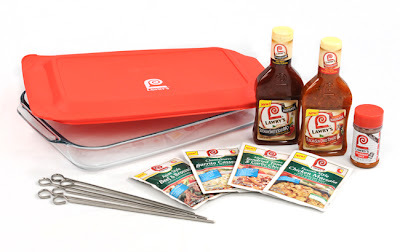 Leave a comment~ Which Lawry's Seasoning Mix / Marinade are you most excited to try? The comment is considered your entry. I would love to try the Tuscan Sun-Dried Tomato Marinade. I like Lawry's on facebook @Crazycatlady Kelly! I would like to try the Baja Chipotle Marinade, thanks! I love Chicken Marsala so I'm excited to try the Tuscan Style Chicken Marsala with Garlic and Basil! I'm a public follower via GFC. I'd love to try the Tuscan Style Chicken Marsala with Garlic and Basil seasonings. #3 I subscribe to your RSS feed. #4 I subscribe to your RSS feed. #5 I subscribe to your RSS feed. #2 I subscribe to your newsletter. #3 I subscribe to your newsletter. #4 I subscribe to your newsletter. #5 I subscribe to your newsletter. I "like" Lowrey's on FB (under my name, Piroska). #2 I "like" Lowrey's on FB (under my name, Piroska). #3 I "like" Lowrey's on FB (under my name, Piroska). #4 I "like" Lowrey's on FB (under my name, Piroska). #5 I "like" Lowrey's on FB (under my name, Piroska). most excited to try the tuscan sundried tomato marinade, mmm! I'm a public follower. I'm most excited to try the Szechuan Sweet & Sour BBQ marinade. I would like to try the Szechuan Sweet & Sour BBQ marinade. yummy! I'm very curious about the Asian Style Beef and Broccoli! I would most like to try the Tuscan Style Chicken Marsala with Garlic and Basil. I love Chicken Marsala but haven't tried to make it at home. I entered the Zutano giveaway. I entered the Ipod giveaway. I entered the My Princess Party To Go giveaway. I entered the Dremel Trio giveaway.